Innovation Lab Excellence dives past the slick surface of espresso machines, youthful techies and creatively designed co-working spaces to examine, in detail, the conditions and practices necessary for a lab and innovation to initiate and thrive. This book goes behind the scenes of working innovation labs to distill a rigorous set of best practices. Apply these to unleash the innovation that will give your enterprise a digital competitive advantage. ●Where you need to rethink what you know about adopting new technology. This guide pulls no punches. It offers expert analysis of the most typical problems—and their solutions—so that your innovation can transcend the hype and achieve tangible results. 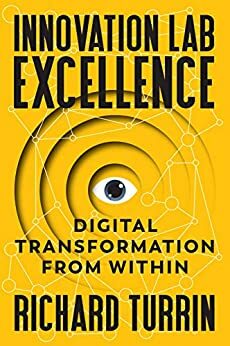 Innovation Lab Excellence is a must-read if you manage an innovation lab, work in one, or are a business manager engaged with one. Richard Turrin is an award-winning executive with more than 20 years of experience in fintech innovation. He is an independent Fintech and AI consultant, helping clients navigate the unchartered waters associated with the latest cognitive technologies. He previously headed fintech for IBM Cognitive Studios Singapore (IBM’s Innovation Lab) and worked for IBM China where he led his team to win the prestigious “Risk Technology Product of the Year” award for his unique hybrid-cloud solution to risk analytics. BOOK PUBLISHING SECRETS FOR ENTREPRENEURS: How to Create an International Best-Selling Book in as Little as 90 Days Without Writing a Single Word! Richard has provided a new and insightful perspective into innovation Labs that is very timely. His best practise approach is based on solid research and lived experience. A worthwhile read for anyone considering an Innovation Lab -could save you a lot of time and heart ache. To my knowledge this is the first book ever written about operating innovation labs. Richard has gone through many years of experience to distill these helpful principles in a very readable way so that we don’t have to make the same mistakes and be able to hit the ground running. Definitely one of those “I wish I had this before I started” kind of books. 5.0 out of 5 starsIs Your Company Spurring Innovation? What do companies need for the future? Turrin has detailed a practical framework for corporate innovation. His examples illustrate sidestepping costly mistakes, springboarding great ideas with a future-oriented perspective and pulling together talent. He also discusses important issues and technologies which may affect how corporations view change and the impact their philosophy. I appreciate the mix of topics: thought-provoking. This book is very well written, and is a no nonsense guide to understanding the world of digital transformation. The practical guidance in insights provided by the author, Richard Turrin, will keep you reading page after page. Highly recommended for all level of experience and interest. Insightful lessons from the field, well-presented, in short, but not too short, snippets. An enjoyable and instructive read.